MicroCurrent Technology is the only esthetic treatment available that can physically firm and tone the skin through muscle re-education. 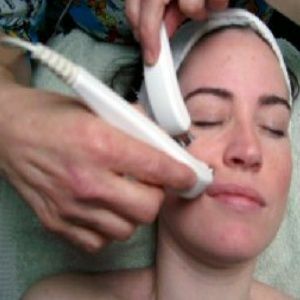 This process of a gentle ‘re-education’ of the fine facial muscles stimulates them with very small amounts of electricity. MicroCurrent is a specific amount of electricity that mirrors the body’s own natural current and works in harmony with the body’s electrical system. Microcurrent instruments deliver minute doses of beneficial current to the cells in order to return the tissue to a normal level of electrical activity. This allows the body to effectively use proteins and other nutrients for cell growth and repair. Every cell in the body generates electrical current and these currents are measurable in the brain, skin, heart and muscles. Modern science recognizes that the body is electrically wired; that our cells generate electricity. Our health depends upon the ability of current to flow freely through our body. The process of healing begins on a cellular level and microcurrent allows the cells to regain their natural energy flow restoring health. Microcurrent stimulates the production of ATP (Adenosine Triphosphate) which is a “reservoir of energy” for the body. ATP is involved in virtually every activity of the cell including nerve transmission, muscle contraction and protein synthesis. ATP stores and delivers fuel to the cells accelerating healing on a cellular level. While providing the body with beneficial electrical current, a microcurrent treatment assists the body in producing and more effectively utilizing proteins and nutrients for cell metabolism and repair. Microcurrent restores normal electrical activity enhancing and accelerating the healing process.